(CBS News) On the heels of a recent poll showing a dip in support for President Obama among Latino voters, the Romney campaign is out with a new Spanish-language ad pledging the candidate's commitment to finding a long-term, bipartisan solution to the nation's immigration challenges. "As president, Mitt Romney will work with Republicans and Democrats to fix our immigration system, which is broken," says Craig Romney, Mitt Romney's son, in the ad, entitled "Nation of Immigrants." Airing on TV in markets across the nation, the most recent Spanish-language spot highlights the Romney campaign's efforts to find an opening among Hispanic voters despite what appears to be Mr. Obama's significant advantage among the demographic. Over the last several months, various polls have suggested that Latinos favor Mr. Obama over Romney by an overwhelming margin: In March, for example, a Fox News Latino poll put Mr. Obama a staggering 56 points ahead of his Republican rival. But some polls suggest a slight erosion of support in recent months: An NBC/WSJ/Telemundo survey of Latino voters from late June found Obama leading Romney by 40 points, and a new Quinnipiac poll shows him leading Romney among Hispanic voters 59 percent to 30 percent. It's important to note, however, that the Quinnipiac poll - which would suggest the most dramatic shift yet in Mr. Obama's support among Latinos - samples a particularly small group of Hispanic voters: Of the 2,722 registered voters surveyed between July 1-8, only 143 were Latino. According to an analysis by NBC Latino, this makes the poll's margin of error with respect to this voting group +/- 8 percent, and likely includes less coverage with regard to regional, national, and language differences among Latino voters. There's also reason to believe that the president's recent announcement, that it will no longer pursue the deportation of many young, undocumented citizens in the U.S., will play well among Latino voters. According to a Miami Herald/Tampa Bay Times/Bay News 9 poll from this week, 66 percent of Florida voters support a form of immigration reform that would allow undocumented immigrants in the U.S. to remain in the country and apply for legal status, and 53 percent support Mr. Obama's deportation initiative. In South Florida, which boasts a large immigrant population, 63 percent support the president's recent move. Immigration reform advocates argue that Mr. Obama's policy announcement will spark a flame of enthusiasm among Latino votersin the general election, boosting turnout rates and Mr. Obama's margin of victory in that demographic. In states like Florida, however, even an uptick in Hispanic support for Romney could ostensibly make a difference in the presidential election. As one of the nation's most diverse and delegate-heavy states, Florida is a key battleground territory, and one that could tip the electoral scales this fall. It also boasts a large population of Cuban-Americans, who tend to vote more Republican than Latinos from South and Central America. Despite his efforts, polls suggest Romney faces an uphill battle when it comes to winning over Hispanic voters: He has said he does not support the DREAM Act as it currently exists, and has touted the concept of "self-deportation" as an alternate immigration plan. As the race to November heats up, the Obama campaign will do its best to remind Hispanic voters of some of Romney's more controversial statements on the subject. Still, Arturo Vargas, executive director of the nonpartisan National Association of Latino Elected and Appointed Officials (NALEO) Educational Fund, argues it's important to exercise caution when looking at national polls of Latino voters. Pointing to a series of recent surveys showing dramatically different results, he said, "one of the questions is, how good are these polls of Latino voters? One of the things that we know is that many polls have been notorious for not being all that accurate." He also noted that candidates are only now ramping up their efforts to woo Hispanic voters. Going forward, he says, it will be imperative for any candidate who wants to win a significant portion of the Latino vote to outline a concrete plan on immigration reform. 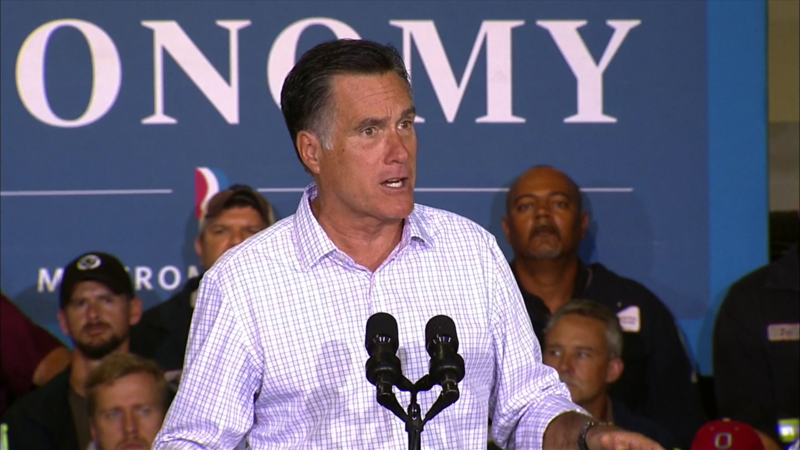 "One issue will be how much will the Obama camp try to bring out Romney's primary positions on immigration in the campaign," he said. "I think what the governor needs to do is engage and be straightforward and direct. What is his position on immigration reform?"